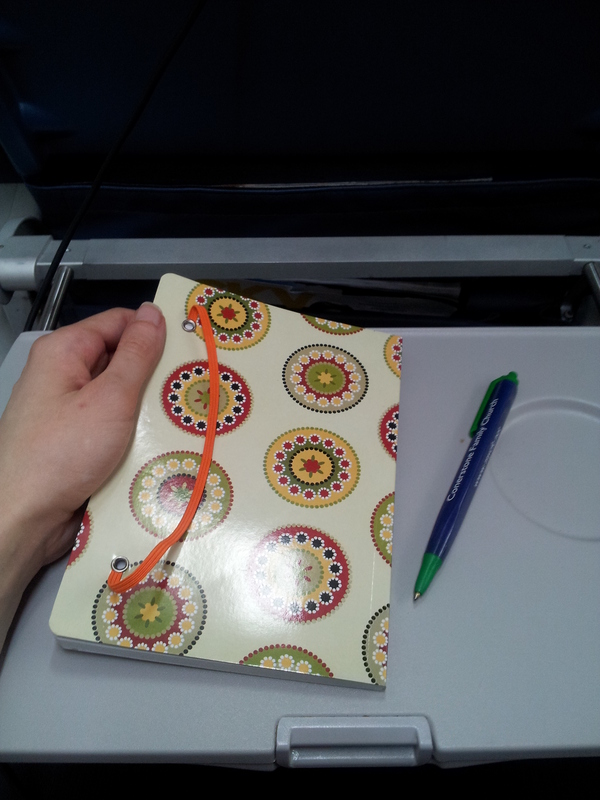 Flying back to RDU from Atlanta at an ungodly hour is a great time to journal! First, a story about the pen in the picture. It has become The Pen™ because it has stayed in my purse or on my person since I accidentally stole it from Pizza Hut back in 2012. (You know how they give you a pen to let you sign the receipt? Yeah. They gave me the pen, I signed the slip, then pocketed the pen without thinking. Not sure if that counts as stealing.) Later on, I was taking a closer look at the pen and realized that the sole purpose in its plastic life was to advertise the spiritual services of Cornerstone Family Church. It must have failed miserably at doing that because the name of the church was misspelled as “Conerstone” on the pen. Now I see why someone left it behind, and now I see why I was meant to find it and keep it with me—as a daily reminder that my job, which involves picking at minutiae like misplaced commas, is actually meaningful. Anyway… the real story in this post is supposed to be about cheap journals that were bought from the dollar store. I can’t remember whether I got the journal in the picture from Family Dollar, the Dollar General, the Super Ten, Five Below, or any of the other myriad “cheap” retail stores. All I remember is that I got it from the cheap retail store by the Walmart. I bought it because it was super cute* and it was only a dollar. I had cash burning a hole in my pocket and figured, “Well, I only have eight million blank notebooks hanging around my bedroom… why not get another one?” Not sure that Dave Ramsey would be happy with my impulse buy… but it was only a dollar! For a dollar store journal, it was pretty durable. I was expecting the binding to come loose or the orange band to come off, but neither of those unfortunate events happened in the two months I was writing in it. The paper was fairly thin and probably made of a very cheap, cancer-causing material, but it wasn’t thin enough that ink bled through the pages. So the only lesson from this otherwise pointless story is that the dollar store is not a bad place to buy journals, provided that you don’t come in with high expectations. You want a Moleskine, you go to Barnes & Noble. *Apparently, I was not the only one to think this. I was sitting in a hotel restaurant with the notebook by my side, and a waiter (not my waiter, so he didn’t do it for a tip) came up to me and told me my notebook was cute. Good to know that another person shares my taste in stationery. or maybe he thought YOU were cute and it was a pickup line? !